A training session in mid-May was my first trip to Raumai Forest. Unfortunately for me, I missed the critical right hand turn off after heading out of Bulls driving out to the beach by mistake, ended up having to back track, arriving late and missing the teams heading out into the forest. This meant I only managed a couple shots of them returning. Note to self, when going to a location the first time by myself, do not rely on memory of checking maps, instead, use GPS as I drive!! Both Eric and Hayden trained with their teams. 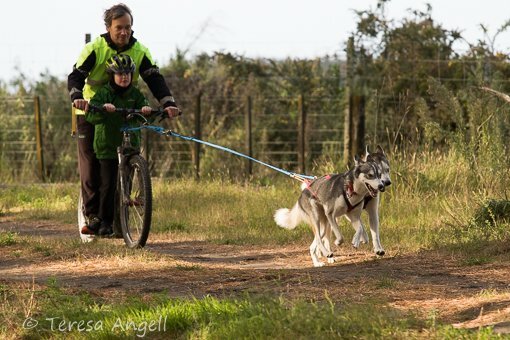 Hayden also took Milla out on a rig as she has a dream to race huskies. Once all the teams were back from their training runs, rested and watered, some other keen young kids got their turn to experience the fun. Sunday morning of the Mock Race I’m up early and on the road at 5.20am. Pulling into the forest area 30 minutes before sunrise, the moon a hazy light shining through the cloud. People were already out walking dogs, getting them prepped and in harness. Eric and Hayden were out checking the trail and Gaby was setting up the BBQ brunch table for hot drinks and yummy food after the run. For me, today was all about getting familiar with the set up area, assessing light conditions on the trail (major challenge as there are very few open areas letting light in), tools and clothing I need to be comfortable, warm and dry. With my four upper body layers, two leg layers, thick woolly socks, hiking boots, beanie and gloves with an added silk liner if needed, I am toastie warm and pretty comfortable. Today’s run is set up the same as Raumai Cup race day, which means I get a good look at what trail signs are used and what they all mean. A great day with everyone getting a good run over the course and the differing trail surfaces. The Raumai Cup race trail has forestry track surfaces, purpose build trails that switch back and wind up and down hills within the trees as well as more open grass areas on the edge of the forest. Both dogs and mushers fitness will be tested on race day! !